In terms of Section 61 of the National Environmental Management: Biodiversity Act, 2004 (Act No. 10 of 2004) (NEMBA), the Scientific Authority is required to make non-detriment findings on the impact of actions relating to the international trade in specimens of threatened or protected species and species included in the Appendices to the Convention on International Trade in Endangered Species of Wild Fauna and Flora (CITES). In terms of Articles III and IV of CITES, an export permit for a specimen of an Appendix I or Appendix II species shall only be granted when the Scientific Authority of the State of export has advised that export will not be detrimental to the survival of that species. The Scientific Authority of South Africa uses the CITES NDF checklist to make non-detriment findings. A non-detriment finding (NDF) is a science-based risk assessment where the vulnerability of a species is considered in relation to how well it is managed (see image below). Factors considered include the biological characteristics of the species and its national status (distribution, abundance, trends and threats), as well as harvest management, control and monitoring, protection of the species from harvest, and incentives and benefits arising from harvest. 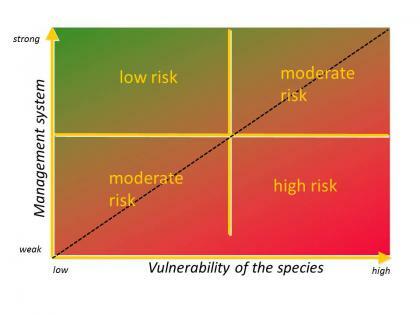 Trade can be allowed for species assessed to be at low risk, or moderate risk in some cases (above dotted line in image below), whereas trade is not advisable for species at high risk. To date, 26 non-detriment findings have been approved by the Scientific Authority, and the Minister of Environmental Affairs has formally published non-detriment findings for the white rhino, the hippopotamus, and the Critically Endangered Encephalartos species (download).